A bachelor’s degree in business is a great investment toward your future. Learn more about the best undergraduate business universities by salary. Wondering where the highest-paid business major graduates went to school? 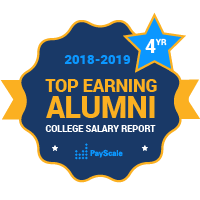 The PayScale College Salary Report has salary data for business majors from hundreds of colleges and universities across the United States. Business can be a lucrative field of study, but it also has one of the biggest ranges in salary potential of any major. It’s important that you choose a school with a proven track record of preparing students for successful careers. Perennial top colleges for business majors include: Georgetown University in Washington D.C., Washington University in St. Louis, the University of Notre Dame, Babson College, and University of Pennsylvania. It should be noted that this ranking does not include salary data from alumni who went on to earn advanced degrees, including MBAs. Many business majors do go on to earn additional degrees, and that often increases earnings beyond those of graduates with only a bachelor’s degree, especially when the student attends a prestigious business school.